The Center for Environmental Energy Engineering (CEEE), a world-renowned research facility at the University of Maryland at College Park (UMD), has been awarded $1.5 million as part of the U.S. Department of Energy’s (DOE) efforts to help homeowners and businesses save money by saving energy. 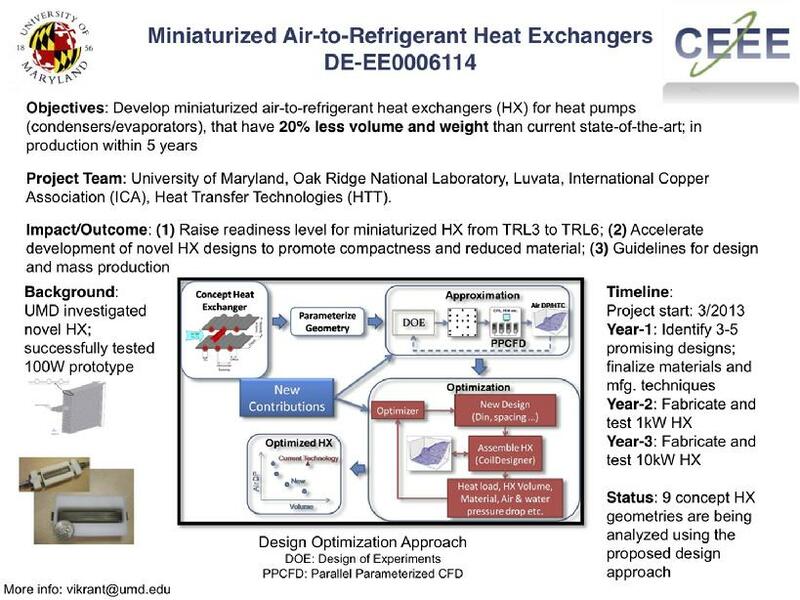 CEEE will conduct research on miniaturized air-to-refrigerant heat exchangers for the project in collaboration with the Knoxville, Tennessee-based Oak Ridge National Laboratory. The UMD research team is comprised of CEEE students, and Dr. Vikrant Aute and Prof. Yunho Hwang. The team will design and build prototypes of miniaturized air-to-refrigerant heat exchangers based on previously developed Parallel Parameterized CFD and Approximation Assisted Optimization technologies. The new heat exchangers are expected to be scale up to 10kW capacity with at least 20 percent less volume and 20 percent less material compared to traditional designs – making air conditioning and refrigeration systems for home use much more energy efficient and affordable. Heat Transfer Technologies is participating as a technical and manufacturing partner.